Halloween 2010 has come and gone and what an awesome time it was! We went to some really fun Halloween parties this year and I enjoyed trick-or-treating with Spiderman AKA Logan. You couldn’t have asked for better weather to trick-or-treat in and this year we did things a little different. Earlier this year we bought a golf cart to use at the resort to get around easier. All the cool people have a golf cart at the resort so this year I got to hang with all the cool people. 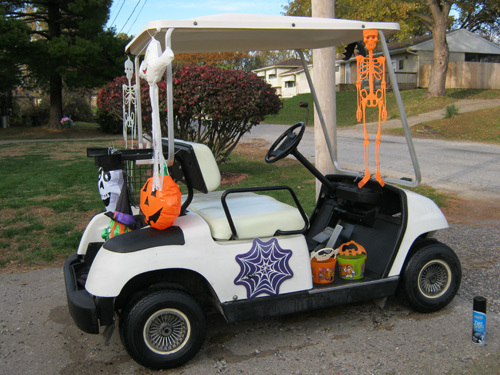 Anyway, we decided to decorate the golf cart and use that to go trick-or-treating on. We even bought a spooky sounds CD and played it nice and loud as we drove around town. Using the golf cart was FANTASTIC! Riding is obviously easier than walking and easier to get around in than a car. Spiderman had no door to open and close and could just slide right in and out of the cart and thus maximizing trick-or-treating. ← Holy #@%* It’s A Deer! Nice cart Gary! My parents made us walk our asses around the neighborhood, they weren’t about to stick 6 kids in a station wagon and drive! Lucky Logan. Thanks Sherri! She is my baby! I will be tricking her out little by little over time and I can’t wait! I know right!? Who has time to procreate like that nowadays? Looks like fun glad you had a great time. I like the decorations and the idea of a CD fun. Logan looks great as spidey. We had a lot of fun…..thanks Starla! Ok now that’s cheating! We had a few people with golf carts in our neighborhood and I called them lazy! There was one golf cart that I just had to laugh at: The kid was driving and there were 3 adults who were totally smashed! I told the kid he should leave them at the end of the street and just walk home, but he was nicer than me I guess! Thanks Tony….I will change the link on my blogroll. You are truly awesome! Love the Halloween decorations on your ride. Glad you guys had a great Halloween! Cute golf cart. That’s a good idea. Ok, you get the coolest dad award. What a sweet ride! Almost like a LIMO. Ha. All it needed was some orange blinking lights and some spinners. I adore the skeleton lantern. The coolest dad award? SWEET! Thanks Angelia! No orange blinking lights BUT it did have a strobe light attached to the back of the cart. You can’t really see it in the photo in the light but after dark it was really cool. Nice wheels! 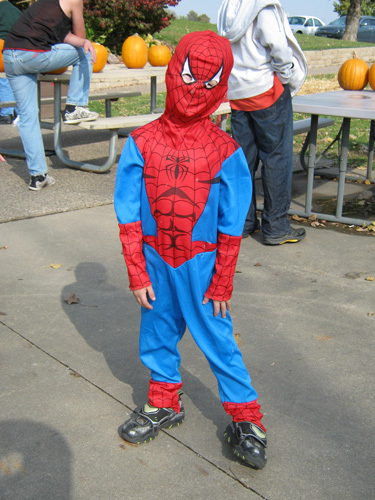 Spiderman trick-or-treated in style!